For the 2016 season the 8Biano Husqvarna racing team decided to have a go at the GP series by running Rui Goncalves in the MXGP World Championship. The team has grown a lot in a year and has an impressive set up. 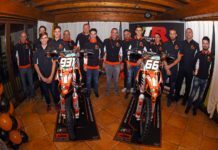 The team will have new goals for the 2017 as they have signed the very promising, Iker Larranaga for the MX2 World Championship. Joining him will be Tanel Leok, he will be the other MXGP rider in the class along with Rui Goncalves. Larranaga was a rookie in 2016 and after coming into the season with an injury he was able to put in some good, top ten results. The Spaniard ended up seventeenth in the series but will be looking much more in 2017 with a year’s experience in the class already behind him. He will be one rider to look out for in the class and the team will receive some good support from Husqvarna. In the MXGP class they will run a more experienced line up in the form of Goncalves and Leok. Leok had some good results on a standard KTM this year so should benefit from having better machinery under him during the 2017 campaign.